I've been keeping this one under wraps so it would be a surprise. 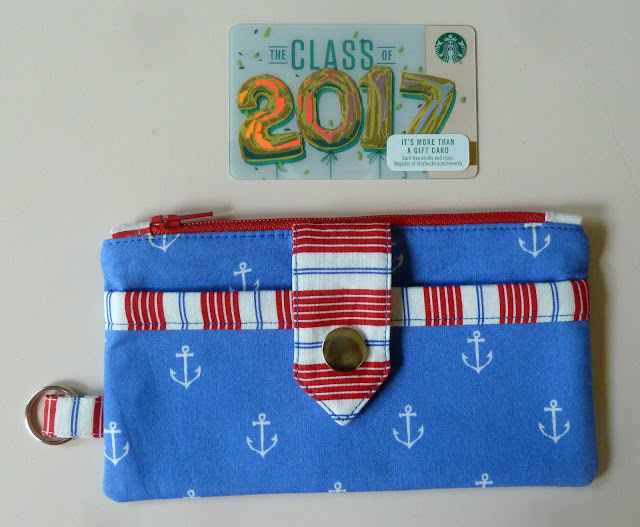 Another family friend graduated from high school this year. Unlike my last graduation gift I actually finished this one in time for her to take it off to college in the fall. I chose this Helix pattern by the Tulip Patch as a nod to the STEM curriculum at Worcester Polytechnic Institute (WPI). Another fan of purple I went back to my stash. I think this design needs two high contrast colors to really work. I decided to go with yellow, another color that I don't have a lot of. 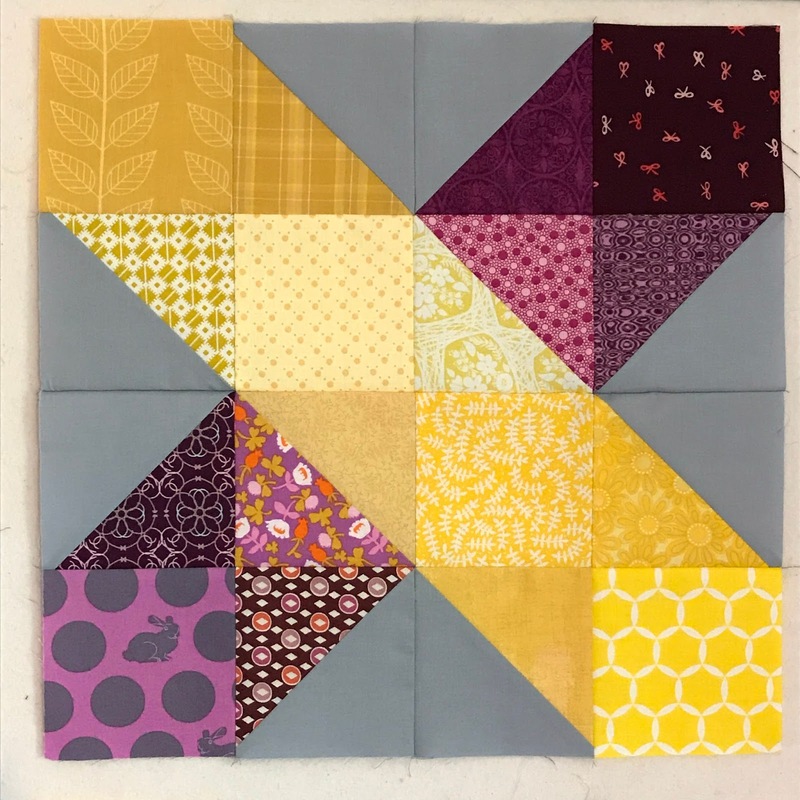 Scrappy quilts aren't really thing so I think using two colors I had in small supply made me push past my usual matchy-matchy tendencies. 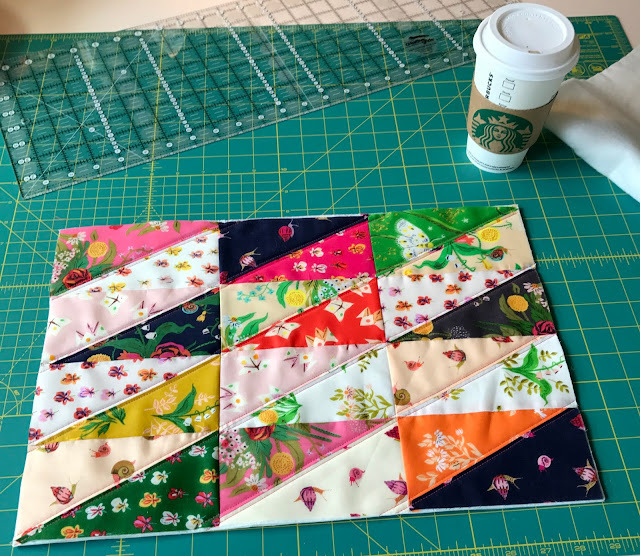 With my squares cut I got to work making my HSTs... all 144 of them. The great thing about this quilt is that while it looks complicated it's actually quite simple to construct. Once all the HSTs are made it's just a matter of putting them together into these star blocks. 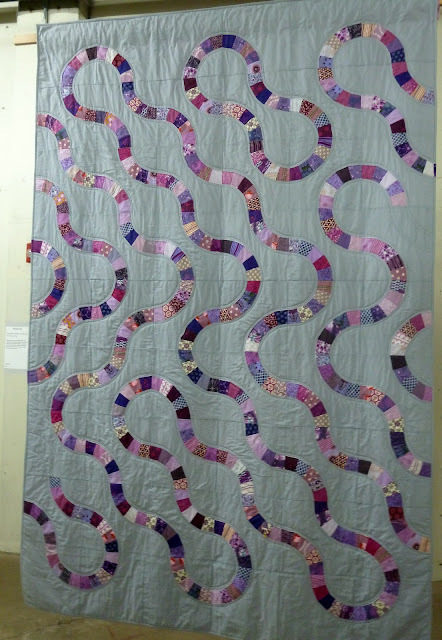 I debated how I was going to quilt this for awhile. My first impulse was to schedule an appointment at Burlington Electric Quilters but I didn't think I could find a chevron pantograph and my ruler work isn't that good. In the end I cleared my living room to baste this and quilted it at home. 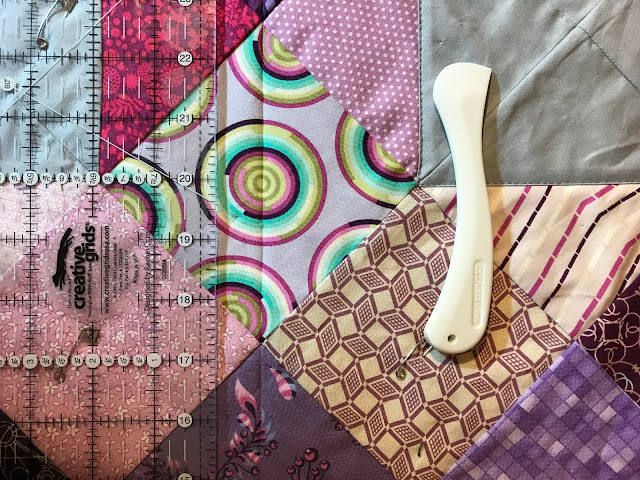 I used a Hera marker to mark my quilting lines. It's amazing how easy they are to follow and yet they totally disappear with a fluff in the dryer. 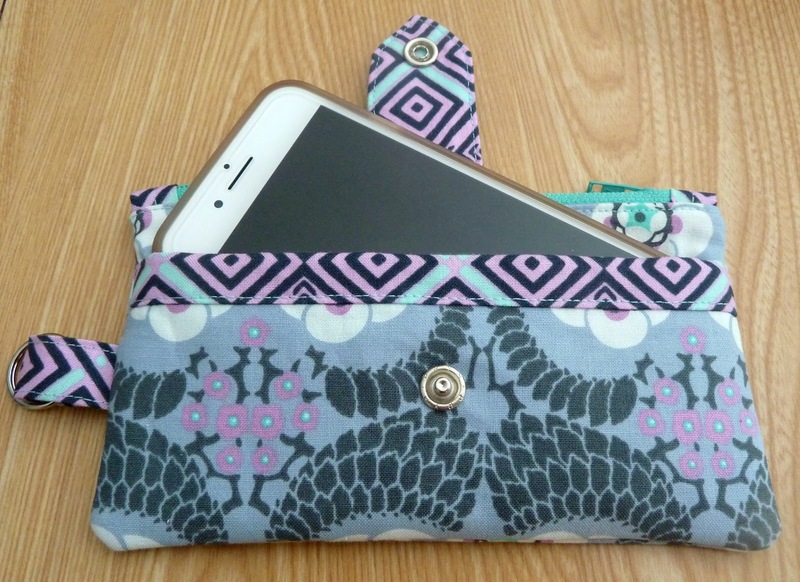 I used the last of my bolt of Fog Cotton Couture to make bias binding to finish this. 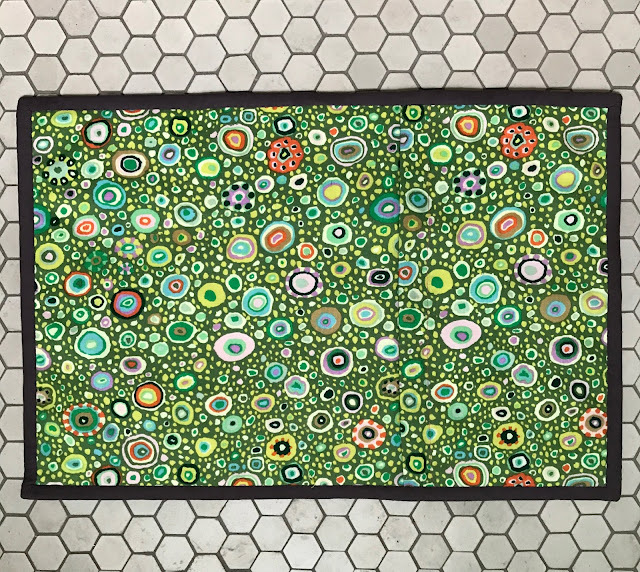 Finished quilt is 70" x 95"
Pattern: Helix by the Tulip Patch. Fabrics: Assorted purple and yellow fabrics from stash. Michael Miller Cotton Couture Fog. Thread: 50 wt. 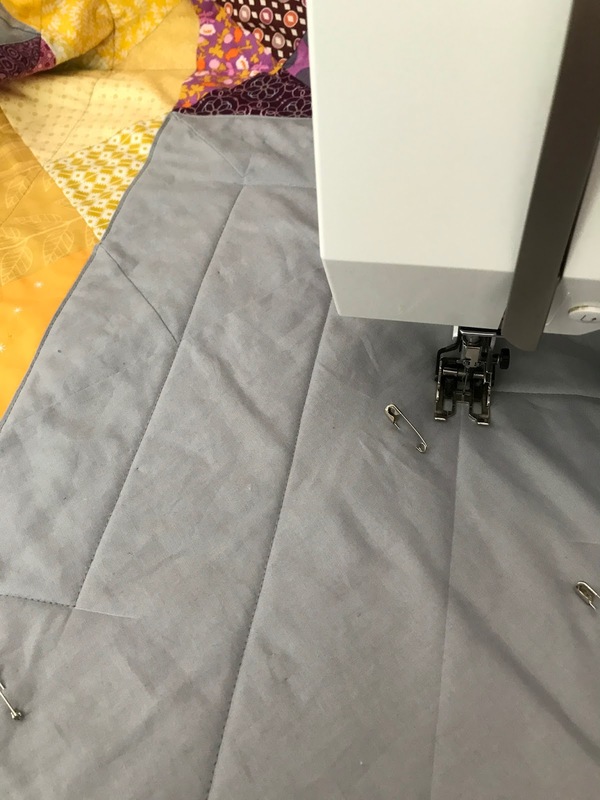 Aurifil in Grey (2605). I got a bit of a break this week and decided it was the perfect opportunity to finally make some July 4th decorations. 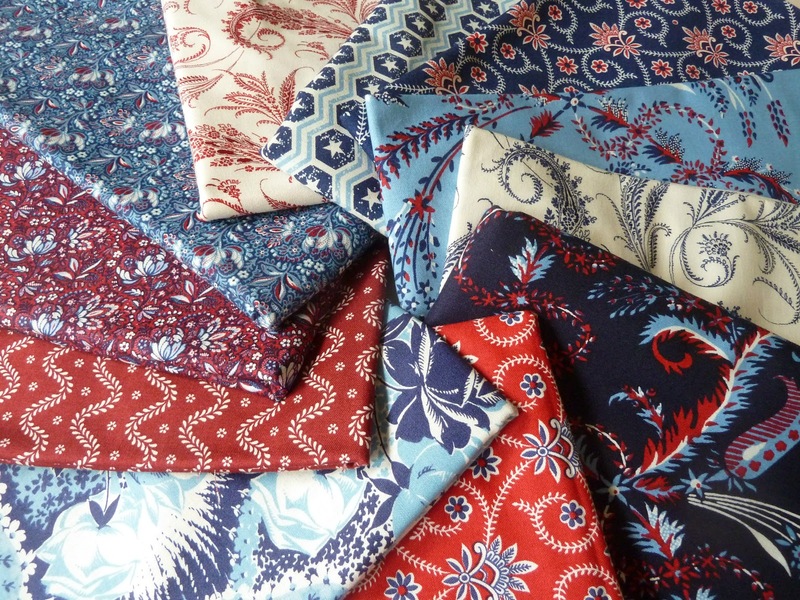 I scored this collection of Anna Griffin Madison prints last summer at Marden's and inspired by From Bolt to Beauty's assertion that Y-seams are no big deal I decided it was time to tackle them myself. 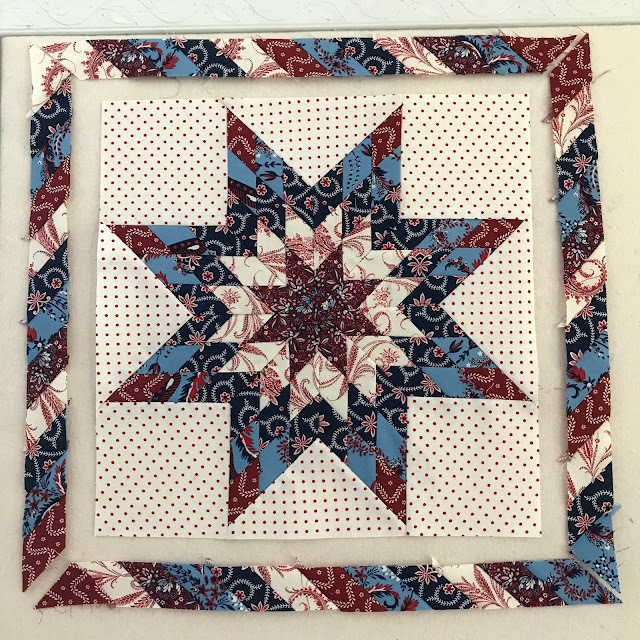 I used this awesome Lone Star Block tutorial by Hopeful Homemaker. As promised with careful marking the Y-seams went together painlessly and in no time I had a finished block. 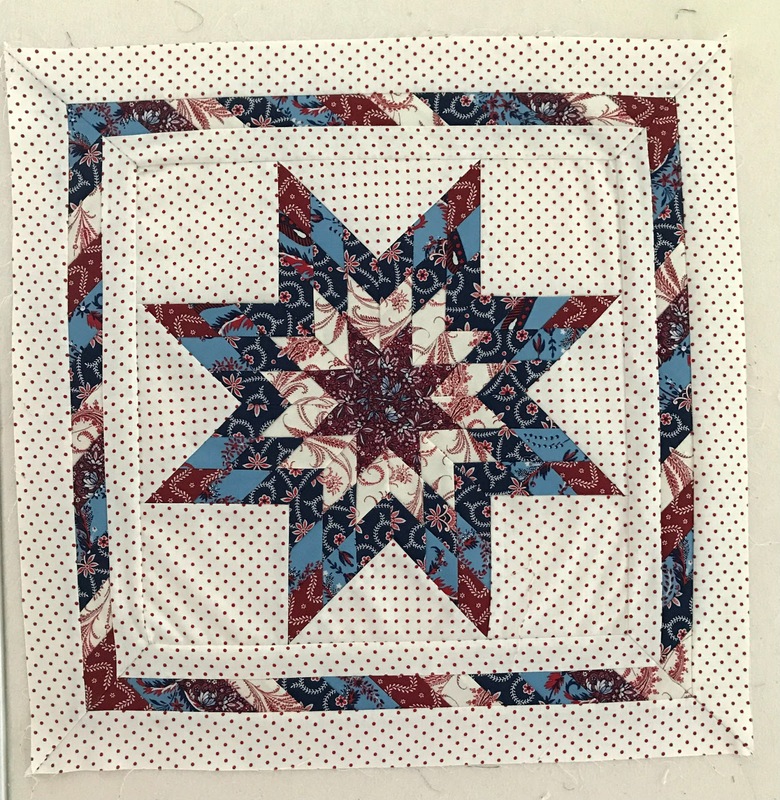 Feeling a bit cocky after my success I decided to use the leftover strips sets to make a border. 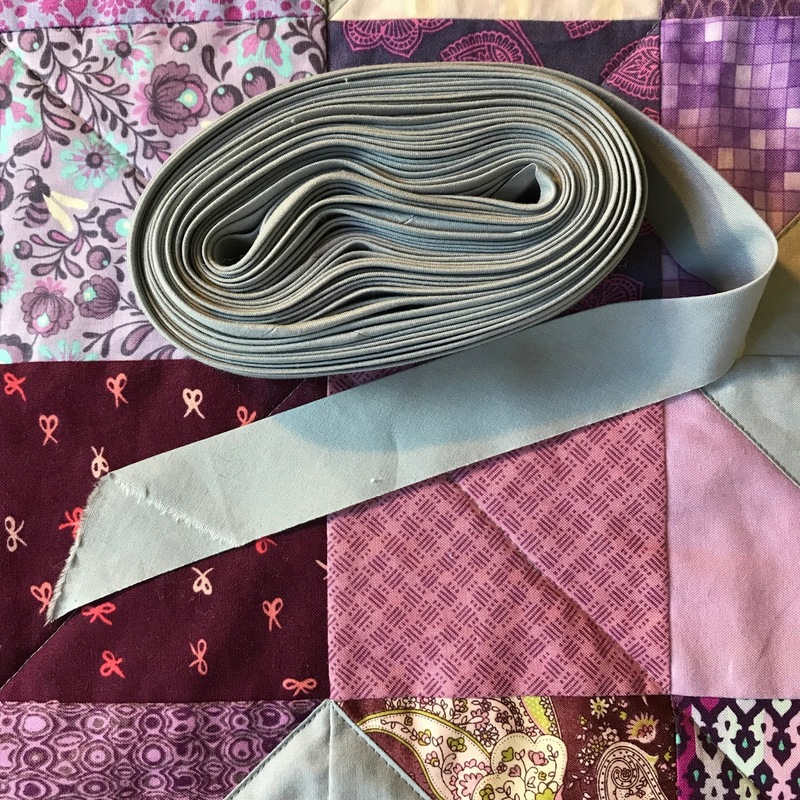 Rather than doing quilt math I took a short cut and just sewed together my pieces into rows that seemed long enough, added an inner and outer border and then trimmed them to size. Rookie mistake!!! With the bias all my borders were not the same size and now I had to do some easing to make things fit. The end result is a bit wonky. 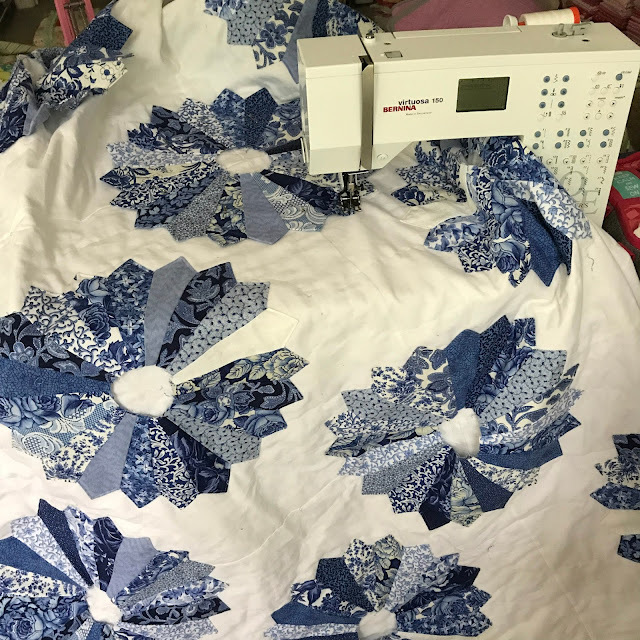 My original plan was to make a wall hanging but I think a pillow will do a better job hiding the uneveness... it'll quilt out, right;-) Undeterred I'm hoping to get this quilted and put together before we leave for Maine. Do you feel compelled to decorate for every holiday? 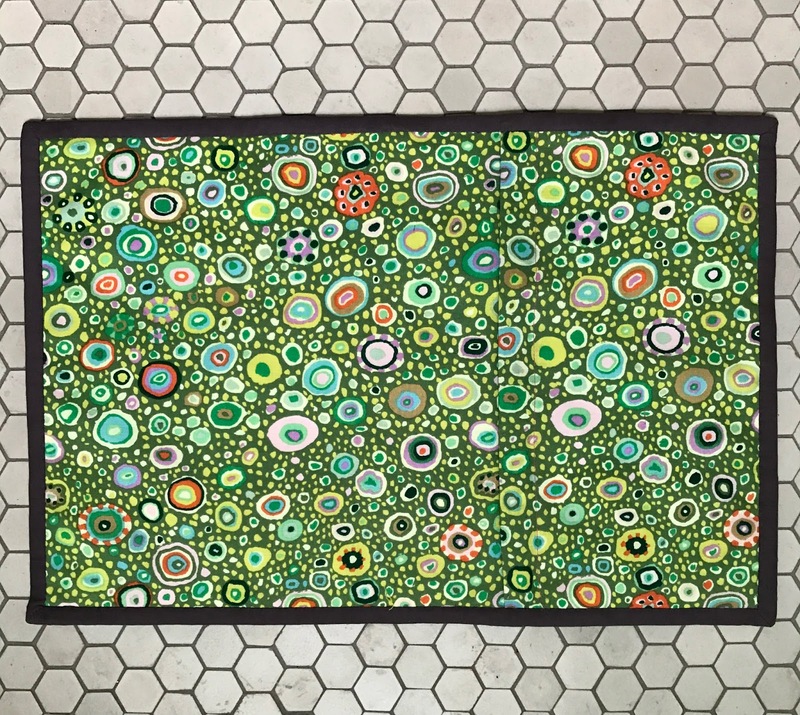 This quilt has certainly taken on a life of its own. 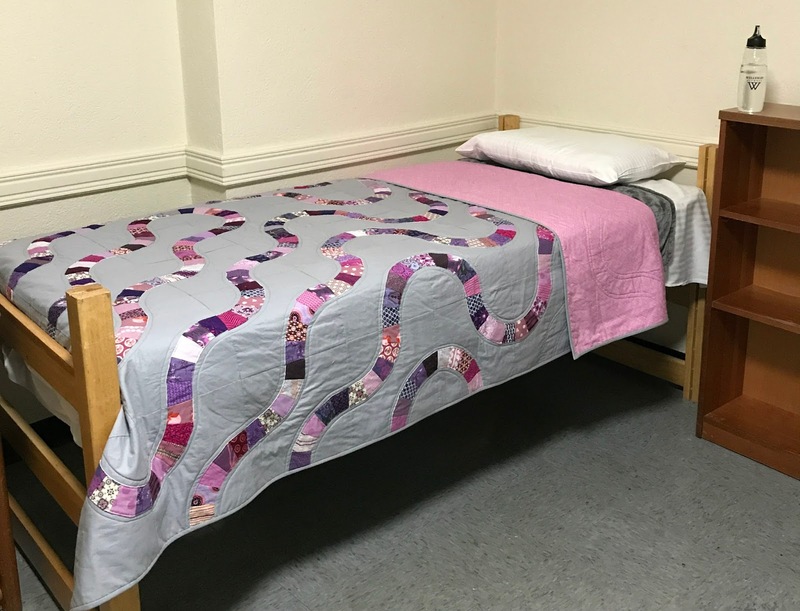 I started it last summer when a good friend of our family who was going off to college mentioned she would appreciate a handmade quilt for her dorm room. I immediately started dreaming up ideas... I loved the idea of making Denyse Schmidt's Snake Trail quilt from Modern Quilts, Traditional Inspiration but I knew I didn't want to deal with curved piecing so I came up with my own technique and whipped up a mini as a proof of concept. With my approach validated I got working. Her only guidelines were for purple and grey... not my usual color palette. I pulled every purple in my stash, bought a bundle, and raided the stashes of a few more violet oriented friends and pulled together enough purples for all the arcs. This quilt is far from perfect. 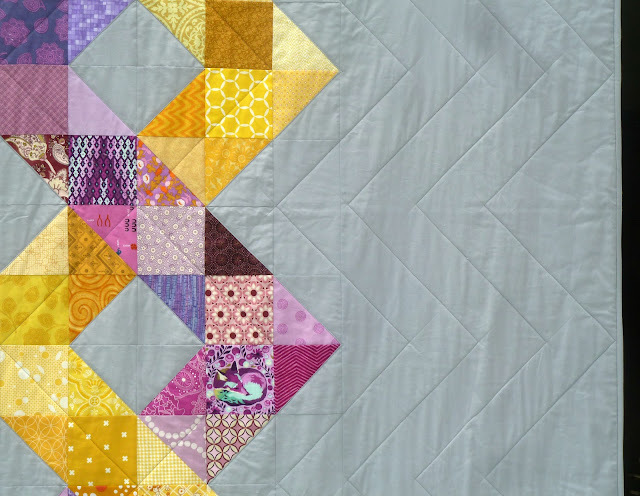 There are a few places where I didn't quite catch my arcs when I pieced together the blocks. 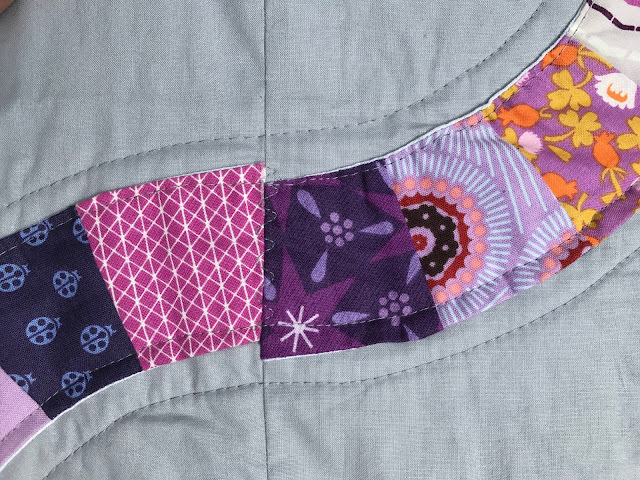 I reinforced those raw edges with a zigzag quilt stitch like the roadblocks that sometimes pop up. I changed up the layout to represent the surprising twists and turns life can take. Dead ends, endless loops it's a metaphor for life. This was on display at this year's BostonMQG Quilt Show at Fabric Place Basement but now that the show has closed I can finally get it to it's intended recipient... just in time for sophomore year. Blazing my own trail with this week's Finish it Up Friday by Crazy Mom Quilts. 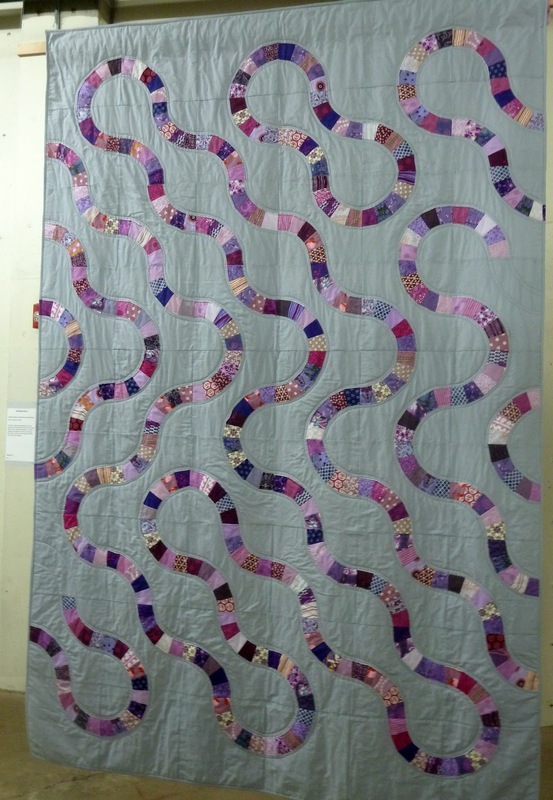 Finished quilt is 65" x 97"
Fabrics: Assorted purple fabrics from stash. Michael Miller Cotton Couture Fog. With school wrapping up I've been frantically trying to wrap up all the loose ends before my schedule gets really crazy. 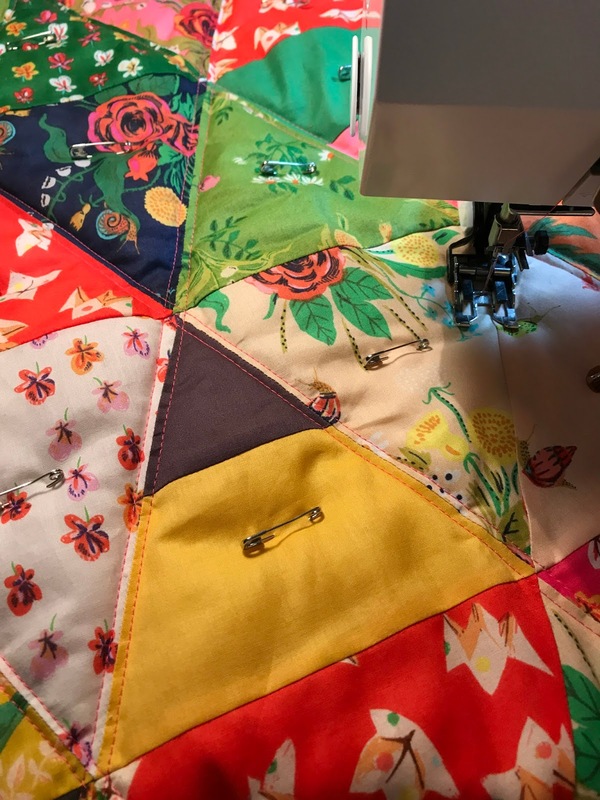 This week's focus has been quilting, quilting, quilting. 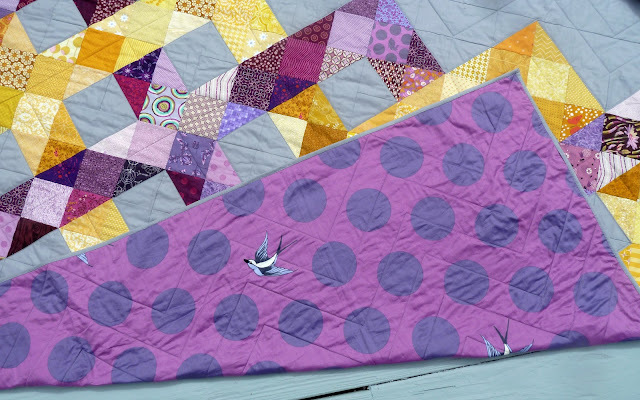 Inspired by my Sleeping Porch pillow finish I also quilted the coordinating triangle quilt. The binding is on but I haven't quite finished tacking it down... good news, road trips ahead. With that quilted I moved on to basting the next flimsy in my stack. Things were going great until I ran out of safety pins. Now that my LQS has closed it's not just a quick trip across town to get more. 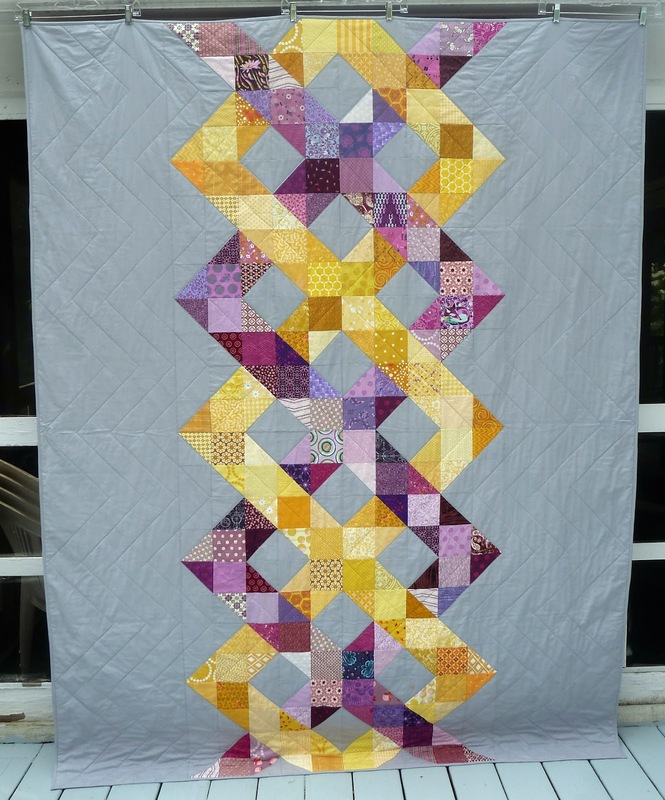 After weighing my options I decided the fastest solution was to quilt something already basted. I grabbed my Blue Plate Special that I basted at Laurena's Longarm and started quilting down the plates. 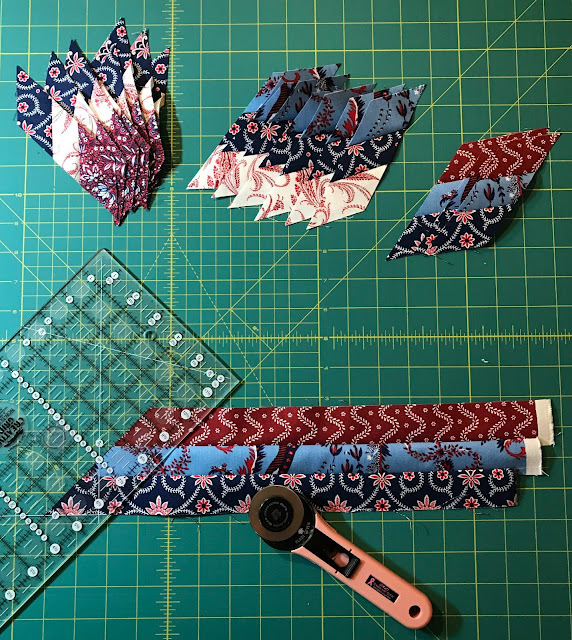 Of course once I started I couldn't stop even though I had enough pins... next step is to add the centers and hand quilt around the plates, another grab and go project that should keep me busy for a loooong time. In these last precious days I'm hoping to get more of my neglected La Pass prepped so I can still stay busy when I can't get in to my sewing studio. What's your plan for sewing this summer? Making Espadrilles was just the kick in the pants I needed to get back to sewing!!! 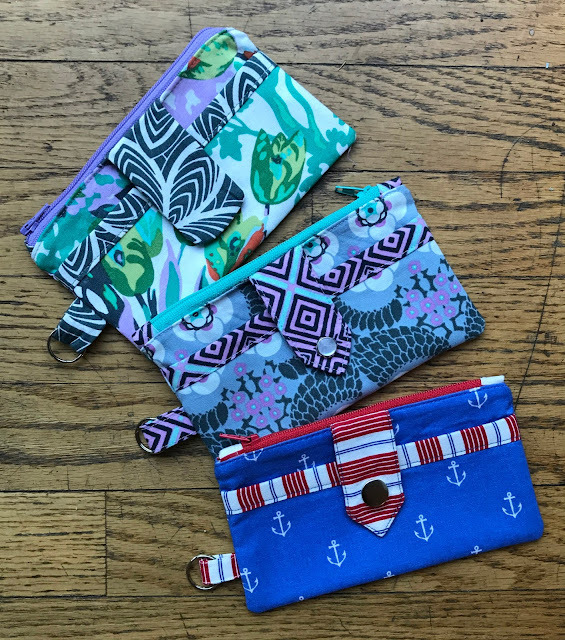 Back while I was waiting for my Sleeping Porch Triangles batting to arrive from Fat Quarter Shop I started sewing together some of the scraps. 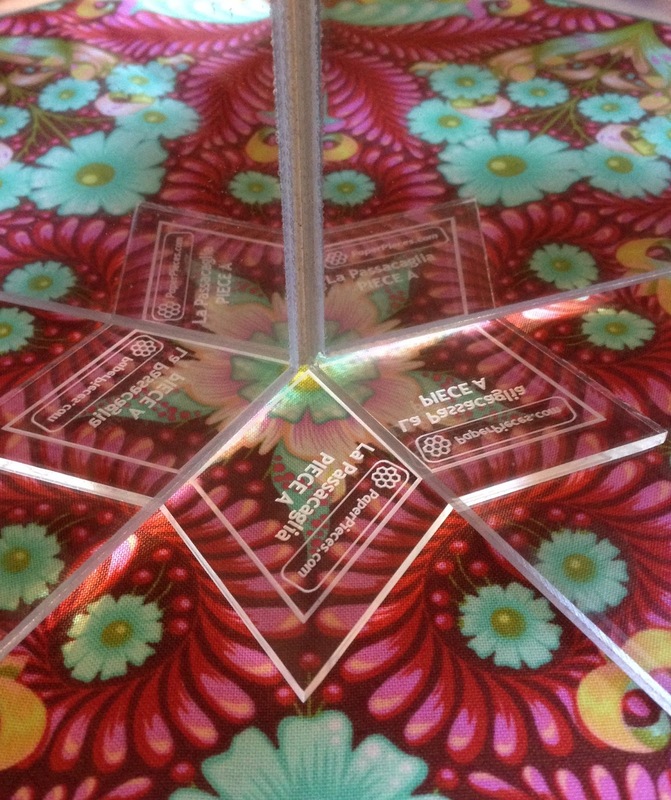 This time instead of triangles I used the end pieces to make Half Square Rectangles (HSRs). 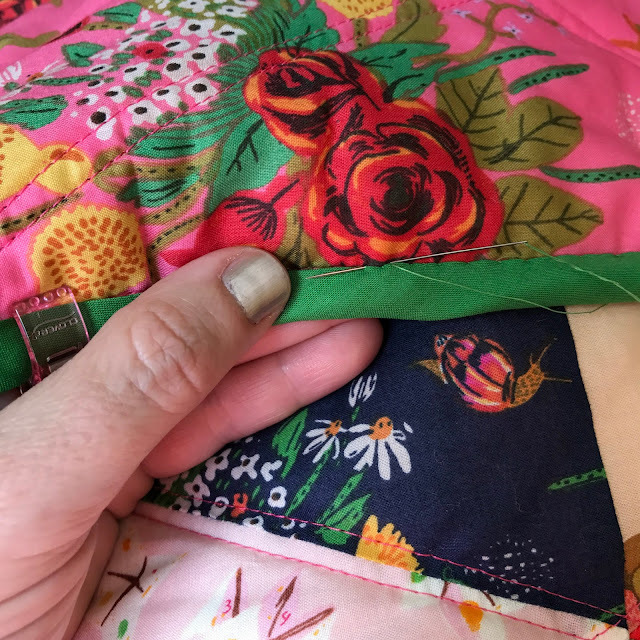 This fabric is so yummy I can't let a single bit go to waste! 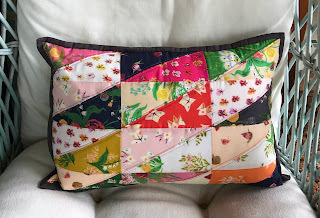 I had enough pieces already cut so now that I was finally back in my studio I put together this little pillow top. I love small projects like this to test thread colors for bigger projects. 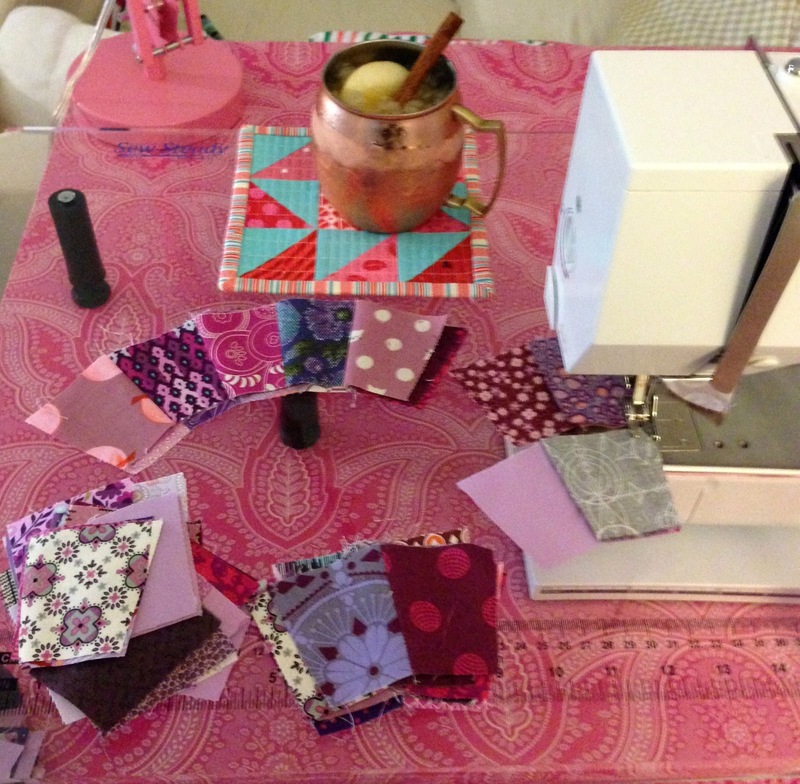 In the end I decided to go with Blossom Pink Aurifil. 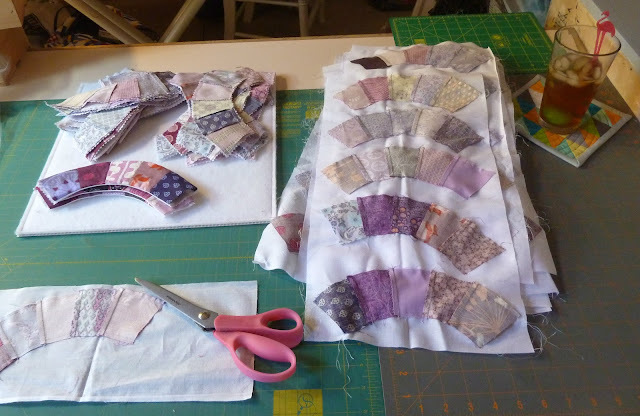 I kept the quilting simple so in no time I had this one ready to finish. I've found I get more use out of pillows than wall hangings so I paired this Kaffe Fassett Roman Glass from my stash with yet another zipper from my endless supply. 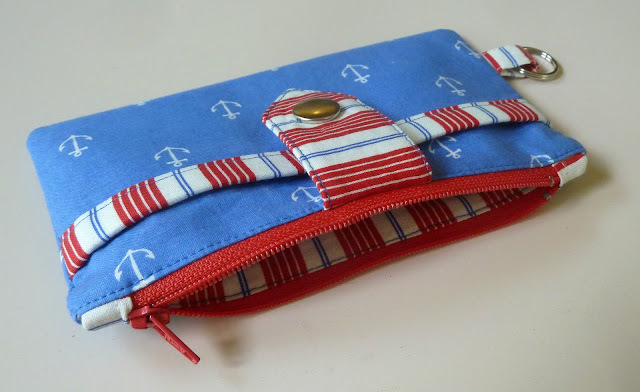 I still haven't found a better zipper tutorial than this one by s.o.t.a.k handmade. Since I was on a roll I even basted my Triangle quilt and got quilting... hopefully I'll have a matched set soon. 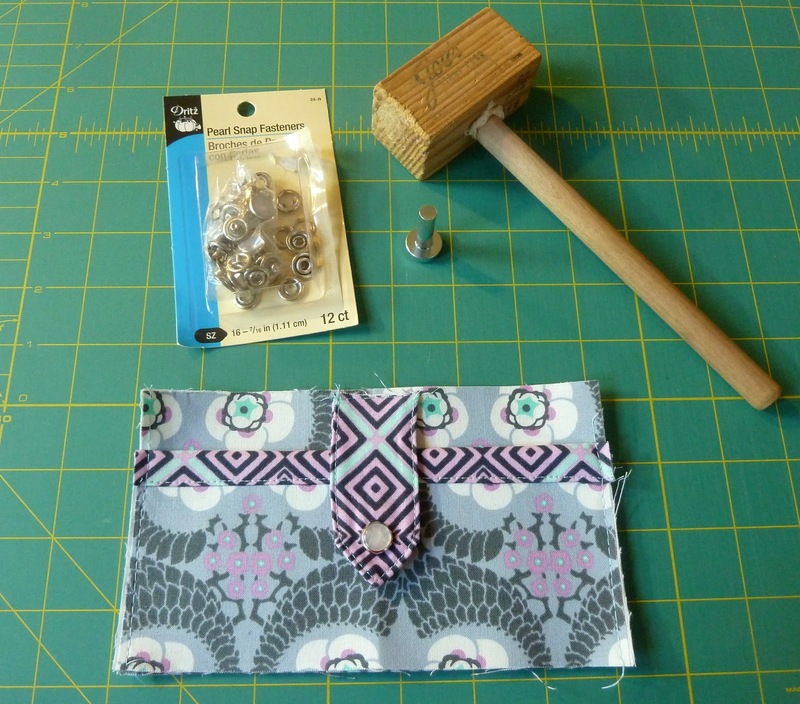 Making stuff with this week's Finish it Up Friday by Crazy Mom Quilts. 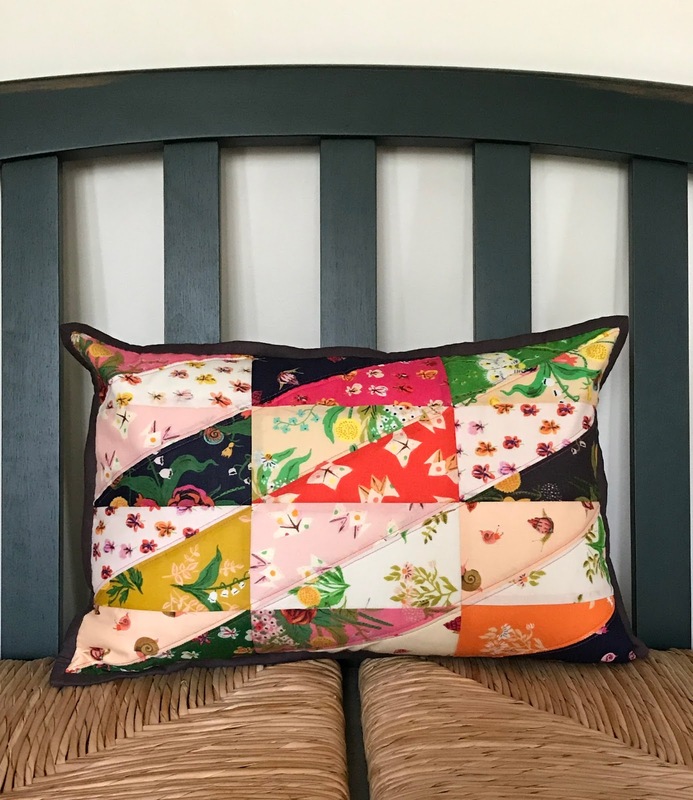 Finished pillow is 12" x 17"
Fabrics: Sleeping Porch by Heather Ross. Roman Glass in Leafy by Kaffe Fassett. Thread: 50 wt. Aurifil in Blossom Pink (2530).